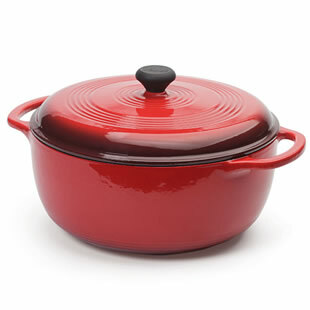 Learn which cooking pots are essential to becoming a better cook. I married a serial pot-dirtier. He cooks, I clean. And clean, and clean. To be fair, it’s hard to clean as you go when you’re preparing different dishes on the stove, in the oven and on the counter. Still, as I wash up in my husband’s wake, I can empathize with the 25 percent of Americans who, according to a new study, don’t cook because they want to avoid dirtying their kitchens. One-pot meals are just the thing to help minimize the mess in this already-extra-busy season. I love having just one thing to wash between dinner and Jeopardy. Having a few good-quality pots at your disposal puts you on the fast track to dinners that are just as easy to clean up after as they are to make. There are three types of skillets that every cook should have: stainless, nonstick and cast-iron. 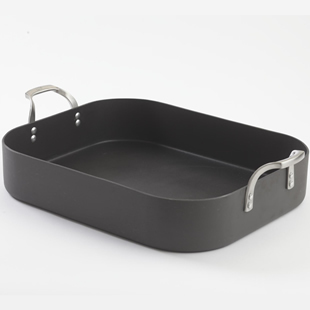 Nonstick skillets allow you to use less oil, and cook delicate foods like eggs without fear of sticking. 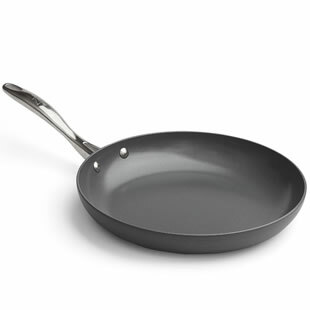 Be sure to look for a nonstick skillet made without PTFE and PFOA: these pans are marketed as “green” or “eco-friendly” and have coatings that won’t break down when used over high heat. Cast-iron skillets are a tried-and-true favorite because you can cook with them over high heat and put them in the oven safely. And a stainless skillet made out of heavy material, which conducts heat evenly and will last for years, is a worthwhile investment. It’s your go-to pan for everything from quick sautéed vegetables to seared pork chops. For as little as $30 you can get a great wok that will last for years. Choose a carbon-steel wok with a flat bottom—they’re light, easy to hold and move, and the flat bottom allows them to sit directly on the burner of your stove, so they get hot enough. 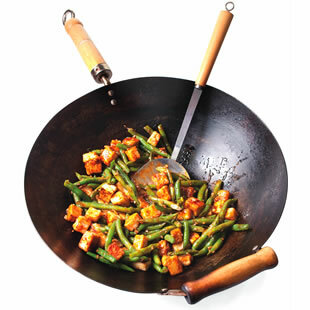 Avoid nonstick woks—most nonstick cookware should not be used over high heat, and many wok stir-fries require high heat for the best results. Choose a roasting pan made of heavy metal so it won’t warp. A basic 14-by-16-inch one with sturdy handles is good for most recipes (and will work for your Thanksgiving turkey as well). If you’re roasting a small amount of food, use a smaller metal pan, about 9 by 13 inches, to keep the pan from drying out and burning. Even though shiny stainless pans are pretty, we find that darker pans brown foods better and make the morsels on the bottom of the pan more luscious for gravy. When we call for a “casserole” we mean a shallow glass or ceramic dish. Sometimes these sorts of dishes have lids, but they are not necessary; you can use foil to cover dishes that need to be cooked covered. If you’re only going to get one casserole dish, go for a 9-by-13-inch (or similar-size) one that holds 3 quarts. You may also want a smaller 7-by-11-inch or 2-quart dish. Glass dishes are great because they’re inexpensive and available at the supermarket. 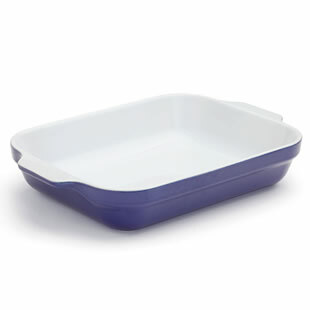 Spend a little more and you can get a ceramic dish that looks pretty on the table and is safe to use under the broiler. 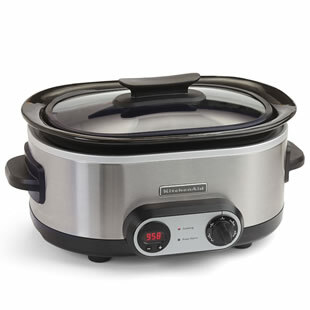 Choose a 5-to-6-quart slow cooker with an adjustable timer that lets you set the time manually and automatically switches to “warm” when the cook time is up. The switch-to-warm feature keeps your food at a safe temperature, so you don’t need to be there when it finishes. A 5- to 6-quart Dutch oven is a good all-purpose size that will work for many recipes, from cooking pasta to braising beef. We use both stainless-steel and enamel-coated cast-iron pots and find that the heavier and sturdier the material, the better it conducts heat and keeps foods from scorching. Check to make sure the lid is tight-fitting to keep moisture in.